Get a perfect bow every time! Gift Pull Bows have many applications. They can be used to decorate wedding, home, flower bunch, fruit basket, Christmas celebration party, etc. You just need to gently pull the ribbon at the middle, and push up the flower cover at the same time, then a beautiful floral bow just comes into view! - Size: 9 x 9 x 5 cm. - Perfect for wrapping presents for birthdays, Valentine's Day, Easter, and Christmas. - A perfect bow every time with a simple pull of two attached ribbon strings; automatically forms in seconds. 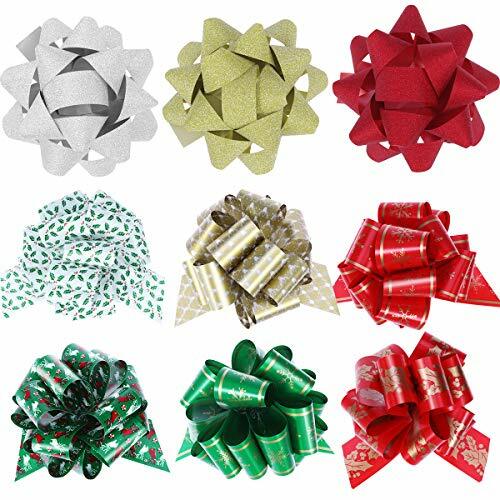 - These beautiful, high quality pull bows are great for decorating gifts, parties, weddings, Christmas trees, wine bottles, and much more. - Fully and fluffy ribbons that are perfect size for Christmas gifts, baskets, and other decor.